Cryptic House LLC has just closed on another rental property, 33 Bennoch Road in Orono. This 4,300 sqft Victorian mansion was built a decade before the Civil War, with bones that are made of monstrously huge post and beam timbers. 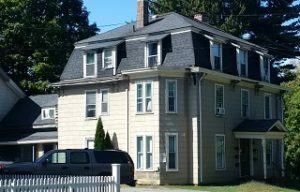 The mansion has been an icon of downtown Orono life for almost 200 years, and with some structural enhancements we expect it will stand for 200 more. Once the exterior has been repainted in 2018, we intend to name this property “Rose Red”. Our capital improvement plan is to dismantle the attached barn, fully renovate 2 of the 5 apartments, and add a second parking lot in the summer of 2017. In 2018 we plan to fully renovate 2 more apartments and paint the exterior. Finally, in 2019 we plan to install a new roof and replace the front lawn with a luxurious stone patio. Our goal of transforming Rose Red into the most beautiful apartment building in the village district will be a six figure, multi-year project and we’re excited to get started!